The repertoire of a prolific composer of music can often be streaky especially when it covers so many styles and idioms, classical and contemporary. But this is never the case with the music of Gene Pritsker who is not only prolific, but whose sensibility seems to subsume a variety of sources – not only of music, but also literature and painting – and is yet a singular voice in contemporary music. Mr Pritsker is also a proverbial chameleon and one is always at a loss as to what to expect from him from one composition to the next. Mr Pritsker’s recorded output can be somewhat thematic and so music on a given disc may also be “of a kind” – if one can at all hazard a guess. And so it is with a good deal of excitement that one welcomes this disc by the Eclectic Music Extravaganza or EMX – co-directed by Kai Schumacher, who also performs on piano here, Philipp Bernhardt, a drummer who also performs here and Mr Pritsker who conducts and performs as a disc-jockey. The very word “disc-jockey” suggests a kind of intrepid character and Mr Pritsker’s music certainly displays this throughout the repertoire. Right out of the gates he takes apart the Bach iconic “Air” (“On a G String”) using the device of dissonance in an elegantly creative manner, something that is also extended to the magical use of the violin as both a reverent and irreverent contrapuntal voice. Naturally one expects nothing to be predictable thereafter – and indeed it is as if Mr Pritsker’s musical world comprises of the sun revolving around the earth instead of otherwise. But even here this results in something quite beyond even the experimentalists who used dissonance in music from Monteverdi to Mahler and even George Russell (One feels at times that Mr Pritsker may be close to Mr Russell’s Lydian Chromatic Concept of Tonal Organization, but every “Eureka” moment apparently in Mr Russell’s direction comes with a doffing of the proverbial hat elsewhere. This is also what makes this recording devilishly beckoning as Bach gives rise to neo-ragtime in “Circus Dreaming Rag” and the diabolically opposed (not in writing style, though) “Middle Ages Rag”, opera of epic Wagnerian proportion with “Quotes From People Born on July 18th” (including a number of artistic luminaries including Yevgeni Yevtushenko, William Makepeace Thakeray and others), an irreverent “Haiku Shout Song Cycle” and even a wry look at “Heavy Metal in the 80’s”. 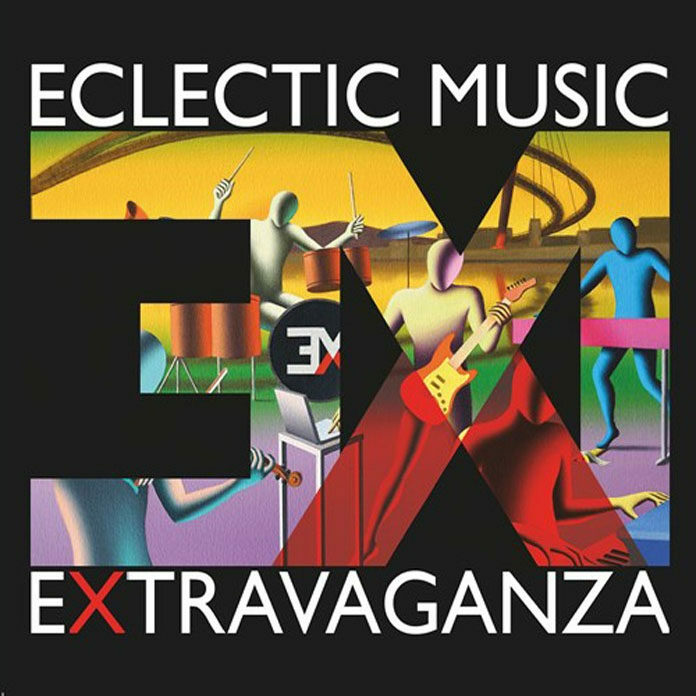 All of this is performed by the EMX who parley with the eloquent familiarity of old friends, yet their playing retains that sense of intrepid etiquette associated, quite naturally, with a group who dares to approach Mr Pritsker’s diabolically complex music with its unpredictable rhythmic leaps and whimsical melodic and harmonic twists and turns. Every musician is exceptional here from Mr Schumacher to trumpeter Franz Hackl, Mr Bernhardt, bassists Nikolai Scharnofske, Paul Kleber, Bel – the beat boxer, the magnificent members of Clair-obscur Saxophonquartett, to the vocalist Thomas Fischer and narrators Zarko Jovasevic and Mark Kostabi, and, of course, the inimitable violinist Petro Kryza. This is a recording that bears listening over and over again for the pure pleasure of it.